The Subversive Archaeologist: You Hafta Be Kidding! It's the weekend, and I've had a hard week, what with trying to deal with the Subversive Archaeologist's very first academic detractor. I prolly screwed up by engaging him publicly. Live and learn. Still, my new colleague from the Netherlands, Dr. Marco Langbroek, has given me the chance to say something juicy about the latest claim for Neanderthal smarts. In that respect it wasn't such a bad week after all! I know! I know! 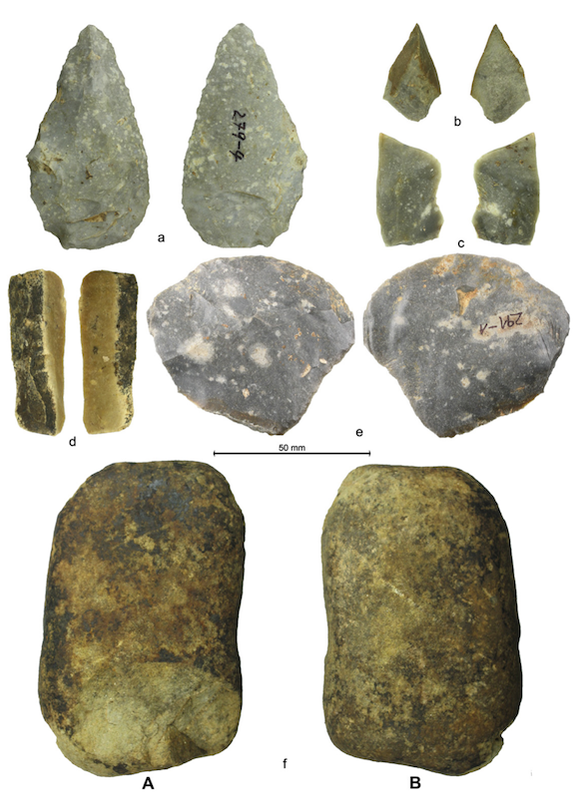 It's another Middle Palaeolithic post. But, WAIT! This post is more about the argument than the Big Questions that interest the archaeologists of modern human origins. As such, it should interest most of you, since no period is free of inferential missteps such as the one I'm about to discuss. I should begin by asking you to remember that any--ANY--archaeological inference is an argument from evidence. Even the recognition of a piece of lithic debitage is heavily theorized from background knowledge, and is implicitly argued into existence every time you say, 'I found a flake.' In today's case, the archaeological interpretation stands or falls on the conjunction of a) empirical observation and b) the arguments linking those observations to well-understood processes that are uniquely capable of producing the phenomenon for which an explanation is sought. In other words, the inference in question is an argument within an argument based on some observations that the archaeologists think can help to explain the phenomenon. Mull that over for a moment. The take-home message is that it's not enough to have some empirical observations--those observations must be evidently pertinent to the overall argument. In this case, the observations themselves don't stand on their own. Instead of being as straightforward as deciding whether one is observing a 1 or a 2, the authors must rely on argument to the effect that it's a 2 because it's probably something like the material that those other 2s are made of. Thus, today's archaeological inference is based on an empirical observation that's argued to be evidence of a phenomenon that the authors argue is the same material that they're familiar with from another archaeological context in which similar arguments were made about similar stuff. *out of breath* Confusing? Try being a referee for this stuff. It's hurts my brain, and perhaps more than anything explains why some stuff gets published that should probably never have seen the light of day. Never mind. On with the show! 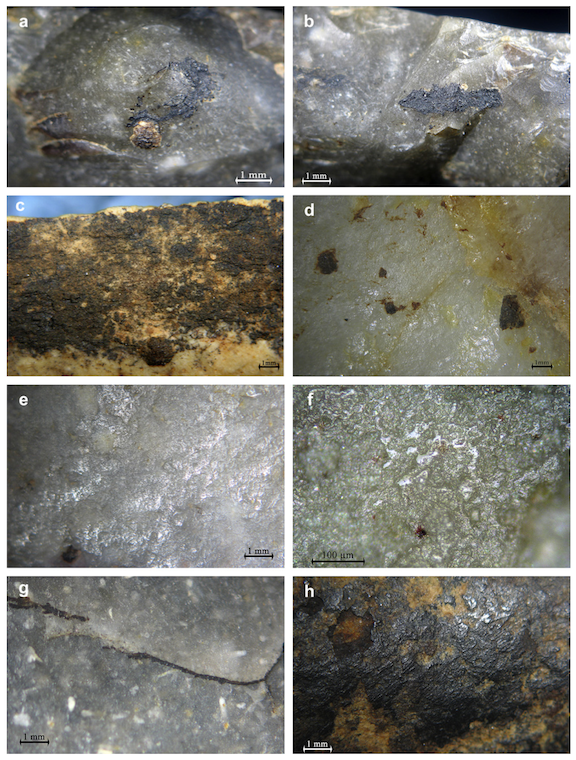 Pawlik and Thissen (2011) claim to have evidence that the mid-to-late Pleistocene inhabitants of Germany used a very sophisticated, dry-distillation process to make a tar from the bark of birch trees, which they used as a mastic to haft stone to some other material, in this case, presumably, wood, bone, or antler. This is a technology not seen again until it's development by the much-later Mesolithic and Neolithic inhabitants of Europe, as well as the inhabitants of the vast birch forests of ancient North America (think Hiawatha). If Pawlik and Thissen's claim were to stand, it would be a HUGE boost for the Neanderthals R Us crowd. Not only would it imply that our congeneric relatives were making what are called 'composite tools,' but also that they were waaayyyy ahead of their time. Kudos to Pawlik and Thissen! Huzzah for the Neanderthals! Uh. Not so fast. Unfortunately for the authors, the evidence presented is insufficient to support their rather extraordinary claim. Have a look at some of the artifacts. Pawlik and Thissen have identified the residue on these artifacts to be that of birch tar. If you put a bunch of birch bark in a sealed container and subject it to high heat for a good, long time, the bark will be reduced to a tar (a process called dry distillation). Birch tar is compounded of guaiacol, phenols, cresol, xylenol, and creosol. These are aromatic organic compounds comprised primarily of Carbon (C), Oxygen (O), and Hydrogen (H). 'dried dark brownish black viscous liquid with micro-hairline cracks in the surface can be seen. It possesses a strong similarity to the birch pitch residues identified on Neolithic tools from the lake dwelling site Burgäschisee-Süd, Switzerland and implements from the Mesolithic sites of Henauhof-Nord, Germany'. So, under a stereo microscope it's VISUALLY similar. See for yourself what they saw under low-power magnification. 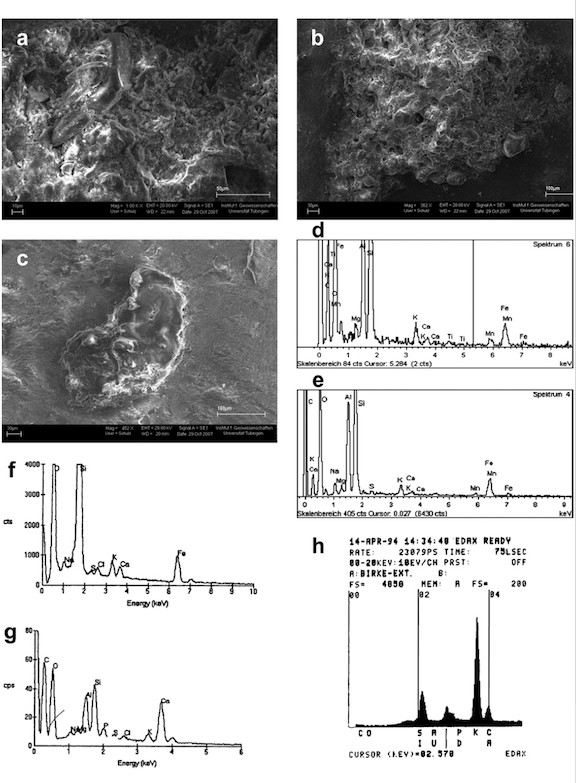 'SEM showed layers of molten plant tissue frazzles and fibres in an amorphous matrix of solidified pitch, thus indicating the vegetable origin of the residues [emphasis added]. So, with no other empirical evidence presented, it's gone from 'looks like it' to 'Hey, it's pitch.' On to the Electron Dispersive X-ray (EDX) examination. The data are reproduced below. From Pawlik and Thissen (2011). The spectra from Inden-Altdorf are d and e. Those from the later Stone Age of Europe are given in f and g. An experiment to make birch tar produced spectrum h. In support of their extraordinary claim, Pawlik and Thissen say only the following by way of interpretation. End of story. Not quite. I didn't see much in the way of a pattern match across the four spectra shown in d through g.
I thought I might be confused by the different size of the X-axis scales. So, I've aligned the four spectra and adjusted the image sizes so that the scales are all the same on the x-axis. Have a look now. The spectrographic evidence. Click to enlarge. Key to elements observer: Carbon (C), oxygen (O), Silicon (Si), calcium (Ca), Manganese (Mn), Magnesium (M), Sulphur (S), Iron (Fe), Potassium (K), Sodium (Na) (after Pawlik and Thissen 2011). All four have, to varying degrees, big C and O peaks. That's a no-brainer, since we're dealing with organic compounds. Because of the ubiquity of C and O in organic compounds of all kinds, you can effectively ignore those two elements in your search for a signature for birch tar. That leaves us with the rest. Looking at the rest, we see peaks of Si in all four. Over 90% of the Earth's crust is composed of silicate minerals, making silicon the second most abundant element in the earth's crust (about 28% by mass) after oxygen. Thus, I would expect to see a peak of Si in any sample taken from the earth's crust, whether it included organic molecules or not. I think you can see where I'm going with this. 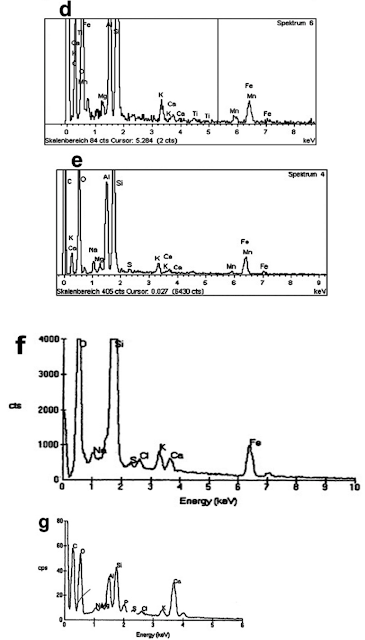 The authors mention, especially, the co-occurrence of calcium, sulphur and potassium in the Inden-Altdorf spectra, and say that they are in that respect similar to the later examples (f and g). 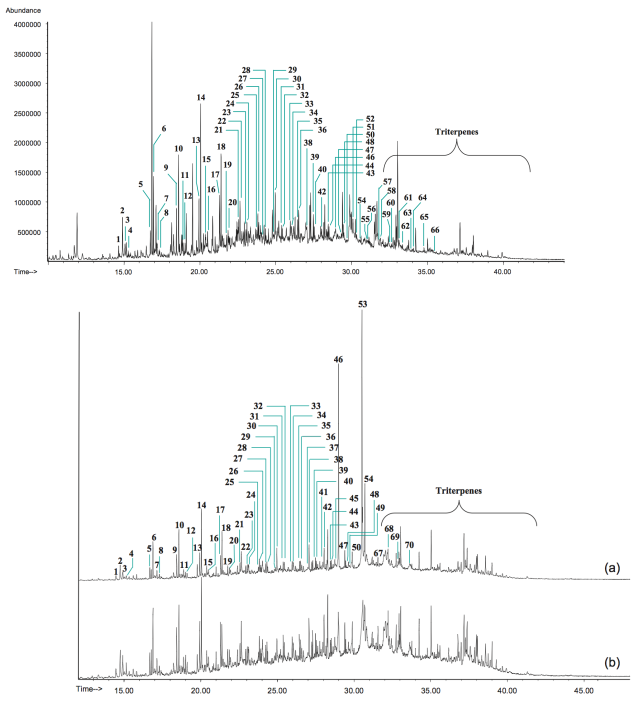 But they ignore manganese, which occurs in the Inden-Altdorf samples, but not in the spectra from later times. So, the question becomes 'Which elements are indicative of birch tar, and which aren't?' The authors are silent on that matter, and thus we are faced with taking their word for it that the four spectra are evidence of the same material. I find that a bit hard to swallow. Call me a skeptic. Call me a pedant. But don't call me a fool. Each of the four chemical signatures are unique, and contain unique occurrences of elements not shared with the other three. To me that means they're similar, but not identical. And we're no closer to understanding their similarities and differences than we were when we were looking at the artifacts macroscopically. To me, this doesn't look like conclusive proof of anything other than that these four samples are organic in nature, and derive from the lithosphere. If these were fingerprints, they wouldn't hold up in court. If they were DNA comparisons, OJ goes free again! I wonder why the archaeologists didn't, at that point, proceed to a true chemical characterization of the substance, rather than relying on the results of a minimal spectroscopic study. Only they know the reason. But there are ways to chemically characterize such substances in a more thorough manner--one that might be considered more conclusive. And whaddayaknow. Someone recently characterized birch tar. 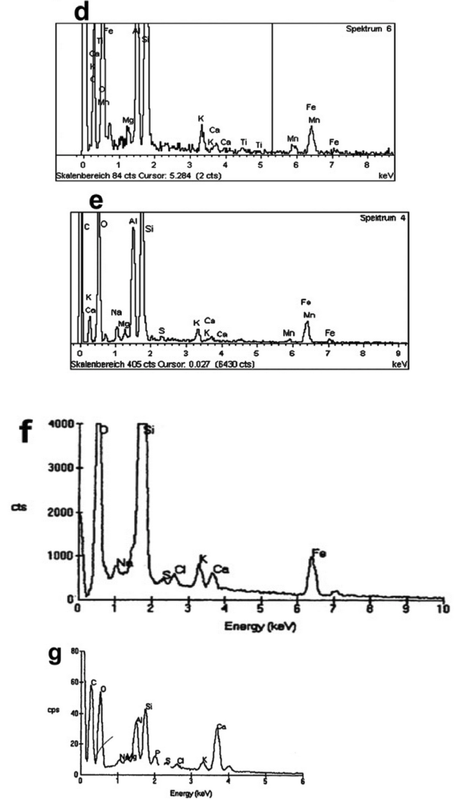 From a 2011 article in Journal of Analytical and Applied Pyrolysis comes 'Analytical pyrolysis with in situ thermally assisted derivatisation, Py(HMDS)-GC/MS, for the chemical characterization of archaeological birch bark tar,' by Ribechini, Bacchiocchi, Deviese, and Colombini. They report on birch tar produced for a comparison with material from ancient Greece and Rome. Their chemical characterization of birch tar was (ow to poot eet?) a smidgeon more specific than that presented by Pawlik and Thissen. For example, instead of finding the elemental constituents of carbon and oxygen, Ribechini et al were able to identify the very organic molecules that comprise birch tar. See for yourself. This is a list of the compounds they identified. Fairly specific, you'd have to say. And not an inorganic molecule among 'em. Moreover, not a single K, Ca, Mn, Mg, or S, if I'm not mistaken. Next, the relative proportions of those 70 compounds. First, the reference birch tar. Below that, the chemical characterizations from ancient Greece and Rome. In this illustration, once again, I've compiled two figures and changed the relative sizes, so as to line up the X-axis at the same scale. The upper part is the reference sample; the lower, double graph, is the story from the ancient Mediterranean. I see a very strong similarity. And the similarity is borne out after closer scrutiny. Relative abundance of inorganic elements, which is the basis of Pawlik and Thissen's thesis, pales by comparison with a real chemical analysis. Perhaps we'll see such an analysis in the near future. But I doubt it. P and T got their thesis published, and now they can hang back and watch the Neanderthals R Us crowd adore them for it. I'm not a chemist. But I see a far better match among Ribechini et al. 's three chemical characterizations than the four EDX spectra that Pawlik and Thissen provide as the basis for their conclusions. At least Ribechini et al. are comparing the reference sample with the subject samples in a more refined manner than Pawlik and Thissen employed. Am I wrong in being skeptical of Pawlik's conclusions? If I am, I should get out of the science business, 'cause Pawlik and Thissen's article sure doesn't look like science to me. More like wishful thinking on their part. Great article! Glad that someone is keeping an eye on dodgy science out there! Interesting. Now, I would like to see you set your teeth into the Campitello Quarry evidence from Italy. I think you'll have a harder time explaining that one away. For the readers who are pay-walled and cannot access the original publication, here is a photo of the flint flake embedded in tar. On the outer side of the tar, is also an impression of the haft it was attached to. Even with a macroscopic look, it is very clear that this is not some ambiguous residue on a flake, but something quite more than that. primarily carbon and oxygen, and just traces of calcium. Mesolithic ages is documented in several European sites"